In case you didn’t know you were in Hillcrest , or AbNormal Heights there is a big sign to tell you. Same goes for University Heights, which despite the marketing does not have a university. Even streets have them. Nothing says NEIGHBORHOOD! in San Diego like a huge sign on the main road. This got some OBceans to thinking that our puny sign, and the first few blocks of Sunset Cliffs Boulevard were not a complimentary enough entryway to OB. They had visions of something more pleasing to the eye, a reward for braving the traffic of Sunset Cliffs Blvd. They all agreed that the billboard needed to go. But OB has a wide spectrum of opinions and that’s about as far as the agreement went. OB’s main entryway is Sunset Cliffs which brings in waves of traffic from the 8 & 5 freeways, and Sea World Drive. Once you are in OB, West Point Loma and Voltaire feed in even more traffic. On a busy weekend afternoon it’s normal to be stuck on Sunset Cliffs between Voltaire and West Point Loma. Both of these corners in our entryway have now sat vacant for 5 years. How did this happen? Back in 1997 the entrance to OB on Sunset Cliffs was narrower. The right turn lane for West Point Loma was much shorter and could not handle as much traffic. 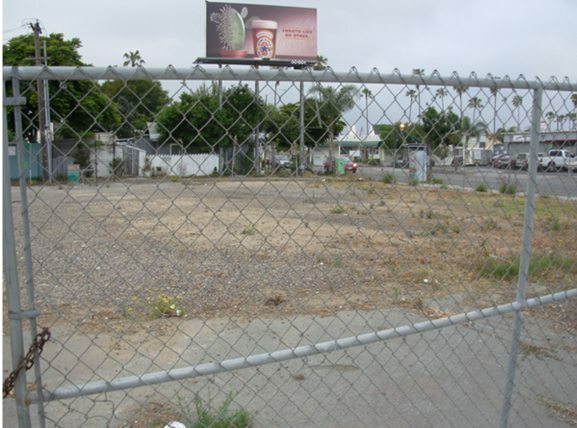 What is now a vacant lot at the corner of West Point Loma and Sunset Cliffs was Anthony’s Pizza restaurant. There was a large billboard above the restaurant that many wanted removed. 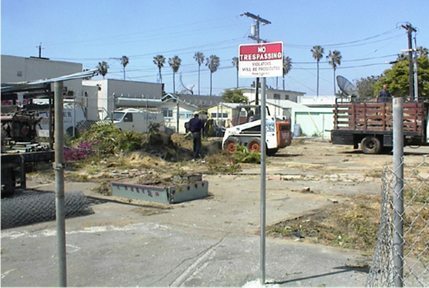 The corner at Voltaire and Sunset Cliffs had been a recycling center until 1998 but then became a vacant lot again when the rent suddenly jumped to $3000/month and the business moved behind Rite-Aid. Around this time two different ideas started to take shape. One came from frustration building among locals who walked by a fenced off garbage-filled lot day after day. The other was a group who decided that OB needed a vehicle to bring in more money. 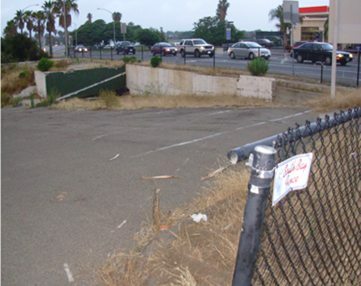 In 1997 councilmember Byron Wear tried to bring a redevelopment zone to OB by labeling the area around the entryway as “blighted” so it would qualify for government funds. His redevelopment scheme did not pan out and he left office under vocal opposition from locals on this and other redevelopment schemes. Still the money flowed into the entryway area through the Ocean Beach Community Development Corporation (OBCDC) for their Entryway Plan. Other local groups like the Ocean Beach Town Council (OBTC) and the Ocean Beach Merchant’s Association (OBMA) were also on board. Over the next few years both ideas grew. One July 4th weekend in 2000 some person(s) removed the fence from the property at the corner of Sunset Cliffs and Voltaire. It had been vacant for 2 years at this point. A tree was planted in memory of Mica Buzkova, a beloved owner of the Bohemia Strudel Factory, and a park began. Community members came together to help build and maintain what was dubbed “Voltaire Park”. The lot Voltaire Park was on is owned by World Oil Corporation. Their plans to build a gas station on the property were denied 3 times at the Ocean Beach Planning Board and with the City of San Diego. But just because they couldn’t build a gas station doesn’t mean they couldn’t bulldoze a community park. On the morning of May 15th, without notice or warning to the community the World Oil Corporation hired Construction Fence to bulldoze and fence off the garden on the corner of Sunset Cliffs and Voltaire St.
Three years ago community members began planting trees and flowers on the long vacant lot. The garden had come to be known as Voltaire Park as trees matured and plants thrived in the polluted soil. The community organized cleanings and weedings to keep the park clean & maintained. Some plants and trees were saved at the last minute by concerned community members. Many people asked the media and community members have gone unanswered. World Oil can is located at 9302 Garfield Ave South Gate, CA 90280. Their phone number is (562) 928-0100. World Oil have been in business since 1941 and are a Southern California distributor for ExxonMobil. They own 2 refineries, a marine terminal as well as 125 retail properties. Their plans to build an Exxon gas station at this location have been rejected twice at community meetings attended by hundreds in 1999 and September 2000. During this time the OBCDC was building their bank account and political capital to push the OB Entryway plan a few blocks from Voltaire Park. They had other OB corporations onboard with their plan, including the OB Merchant’s Association and the OB Town Council. The OB Planning Board had given mixed reviews. By 2002 they had enough money and political clout along with the City to buy the lot at the corner of West Point Loma and Sunset Cliffs. This was the lot that housed Anthony’s Pizza, a local restaurant that had a loyal delivery and dine-in following among locals. After acquiring the lot Anthony’s Pizza restaurant was demolished with promises of a beautiful new entry way, a new right turn lane and a “gateway park”. 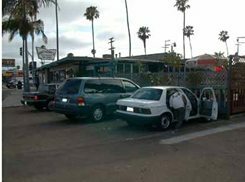 The extended right turn lane and yet more traffic on Sunset Cliffs became a reality in 2004. Now many more cars, trucks and SUVs can cram their way in and out of OB on the expanded roadway. Unfortunately the surface streets are still just as small and traffic invariably grinds to a screeching halt once you get close to West Point Loma. The gateway park was not so lucky. The government money train slowed, the City’s belt tightened and once again OBceans got an empty fenced off lot instead of a park. By 2007 the money had dried up even to pay Kurt Lutz’s $62,000 OBCDC executive director salary and he left the OBCDC. The entryway now sits as a vacant lot waiting for the community or city to pony up enough money to build a park. 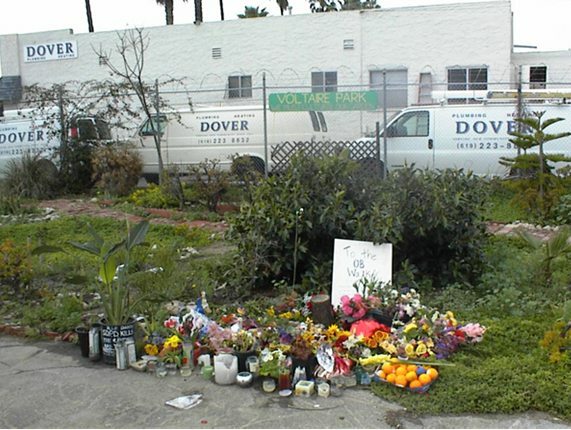 Voltaire Park lasted for three years at the corner of Sunset Cliffs Blvd and Voltaire St without any support, financial or otherwise, from the OB corporations. Down Sunset Cliffs Boulevard on the corner of West Point Loma, the full support of the OBCDC, OB Town Council and OB Merchant’s Association has yet to produce a park. In just the last 3 years these organizations have collected $1,827,191 in gross receipts in the name of OB. Yet these two corners have now sat vacant for 5 years. If only the community people and the money people could have worked together we might have a park instead of a decade of empty lots. Be careful what you ask for: I smell a maintenance assessment district cooking. Can you enlarge the photos? when I click on them, they don’t enlarge, and one really cannot see the content – and they look interesting, but the detail is very small. We will Anon as soon as our technical staff get home from work. It was a matter of the article being posted from one computer across town and the photos were posted in as thumbnails. We’ll enlarge them all very soon. Their content is too valuable to be unseen. Beautiful and horrific photos! Great writing, almost brought tears to me eyes. I remember when the Voltaire site was a garden, and there were folks out there on weekends cleaning it up. The point I was making is that the non-profit groups already pulled in enough money that we should have a park by now. I wasn’t advocating for yet another 501(c)3 corporation in OB. The Voltaire Garden thrived for years. 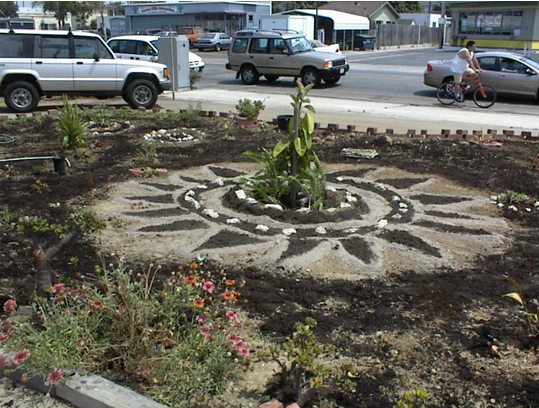 The Ocean Beach Grassroots Organization (OBGO) took upon itself the care and maintenance and development of the corner lot, once a gas station, then a re-cycling center, then an eye-sore where people threw junk and trash. 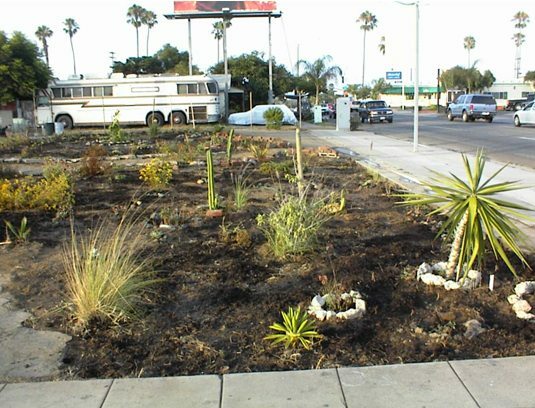 OBGO cleaned up the weeds, picked up the old asphalt, planted flowers, bushes, trees, installed walk-ways, put in some benches, set up a watering system, worked with the City to ensure that it was kept cleaned up. World Oil simply left it unattended for years. 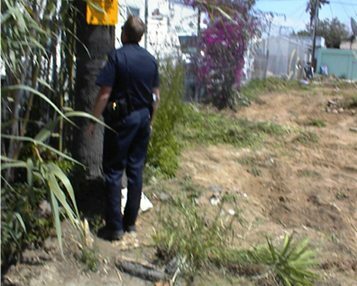 Everyone knew OBGO was doing this, and yes, it was private property, but it was also a public nuisance, a trash heap at an active intersection. Then without warning, the bulldozers arrived with a van full of police officers, and changed it all. So, the City knew and even managed to hand over a patrol of uniformed officers for the morning. Incredible. The City could have warned us to enable folks to dig up some of the bushes and trees for replanting. But obviously the City feared some kind of protest, so the cops were sent. No one protested at the time. So, the corner lot just sits there, grabbing wind-blown crap, collecting candidate signs, and symbolizing the state of things in OB these days. Marc, exactly. You were making a good point, that the nonprofits had collected enough $$ to do something…so why haven’t they? Maybe they’d like to force people to give more $$: If they think they need more $$ AND want to ensure that a park will be all theirs to control, AND they want a big cut to keep for “management” fees …the city would be glad to show them how to assess property owners and force money to be allocated to them. It would no longer be a community park created by volunteers: it would be a little CDC empire and a perpetual money pot. Oh, and the city would get a 4% cut for overseeing the CDC’s +15% management cut. Great story on this; however, if you really want to be disappointed….attend one of those obcdc meetings and you will understand why they can’t get it together and accomplish much. Combine that with the total membership of he planing board, board board, Town Board, Mainstreet Board, and the four bums on the Seawall and you only get about — 12 people. In their credit, you wouldn’t believe how much money the city has raped from the community coffers during the process so far. I don’t have the numbers but the work they have done so far is in the 100s of thousands… All due to the overbearing rules of public works projects that the city demands. If you want to be angry….get angry about your “government” stealing back taxpayer dollars and making sure their developer buddies get a paycheck. OB needs to wake up and take a stake in what is going on. Activism takes numbers….elected people don’t care unless constituents are at stake….simple truth…OB doesn’t vote and therefore makes itself irrelevant. OB Tony – appreciate your thoughts and stance in OB. Seems there are waves of activism – and we’re in a lull right now, altho’ there are some signs of renewal of the activist spirit. I was part of a wave of activism that began with the formation of Ocean Beach Grassroots Organization (OBGO) and we were very active for about 6 years. Burn-out, people moving away or changing focus cost OBGO its key membership. Here’s a few things OBGO did: it awakened the community to the City’s plans to ring Mission Bay with hotels, making OB a tourist stop-off point; it took on the issue of possible toxic leakage from an old waste dump right next to SeaWorld and got the City via Donna Frye to do a $.5 M study – that found that nothing toxic was leaking, altho’ it’s too toxic to dig down, therefore, nothing beyond bike lanes and park benches can be built on the site; we took on SeaWorld with its plans to bring in a roller coaster ride, getting away from its focus on the sea and its creatures; we were part of winning coalitions on both the OB Planning Board and the Peninsula Planning Committee for years; OBGO had a majority on the OBPB for a good number of moons, attempting to limit the most outrageous development and keep the City to the OB Precise Plan – which the City keeps wanting to rewrite and water-down; OBGO led the community in its response to the shooting death of Danny the Walker, a homeless man shot down in front of dozens of OB residents, staging a vigil and demonstration against police brutality within days attended by 500 people; OBGO also sponsored anti-Iraq war demonstrations and joined with other groups and folks in the local peace & justice coalition; we were supportive and active wthin the San Diego Housing Coalition; and pertaining to Marc’s article, we joined other locals in developing Voltaire Park, and maintained it for a few years until World Oil bulldozed the park with City Police looking on to prevent any counter protests by residents. We also in OBGO”s later months, sponsored a series of free films and discussions; we had a web site that had thousands of hits daily; some of us helped publish a version of the OB Rag. Okay, I’ve tooted OBGO’s horn to show that OB has had these waves of activism. It had one in the 1970s, another in the eighties and then again in the 90s. It’s time again. With local residents getting involved around traffic issues – like the dangers on Sunset Cliffs Blvd, and the need for a roundabout at Greene St. – and development issues, we can see the beginning simmering perhaps of another wave of OB activism. Ocean Beach is worth it. People in OB vote at about the same rate as the rest of San Diego… but OB is small, their votes aren’t going to swing a district 2 city council race let alone a city-wide office. Excellent story and great images. I’m glad to see you’re a member of the fine staff at OBrag.org. It’s truly sad to see how little regard OB gets from San Diego City Hall. Kevin Faulconer continues to push for booze bans on the beach and does little or nothing to improve OB’s crumbling infrastructure. One wonders if OB should not incorporate itself like Carlsbad just did. “The City of Ocean Beach” sure has a nice ring to it! Tito – great of you to check in from Costa Rico. On the issue of OB’s governing itself, a group in the 1970s here in OB actually looked into it. The OB Community Planning Group, totally dissatisfied with city services (police, planning, council representation) researched Ocean Beach becoming its own municipality. I was part of this effort. I recall we contacted folks in Venice Beach who were also looking into self-government. We finally figured out that because the vast majority of OB residents are tenants, there is an insufficient tax base here to provide the services that a city must provide. Can you imagine OB contracting with the Sheriff’s Dept for law enforcement? IN the end, we dropped the effort and decided to help form the OB Planning Board – which still exists to this day (although it has a growing body of critics who feel that the City no longer caters to its decisions). 1. I openly opposed a gas station at Sunset Cliffs Blvd. and Voltaire. World Oil was upset about my position. I actually thought a diner or small restuarant to serve the Voltaire area or some other community serving small business would work. OB had enough gas stations. 2. I floated the idea of a redevelopment area for Ocean Beach as a way to bring incremental taxes to pay for infrastructure. I later supported the creation of an OB Historical District to save the craftsman beach cottages. My redevelopment proposal would have, in fact, kept residential from eminent domain. Incremental property taxes could have paid for a new Library for OB. The new Hervey Library in Point Loma included $5 Million in redevelopment funds as well as $5 Million from the Hervey Family. I had the guts to show up at the community meeting on redevelopment and explained to all present to have a good debate and I would follow the lead of the Planning Board. I kept my word. 3. I was always supportive of the entryway project, provided funding to purchase the Anthony’s site as a plaza/park and led the effort to remove the billboard. 4. I transferred $4 Million in undergrounding funds from Downtown’s East Village to OB for the undergrounding of Voltaire Street, West Point Loma and Sunset Cliffs Blvd. Thanks for the chance to comment and have a great Summer. Wow, unfortunate all of the entryway progress we have made (street widening, median landscaping, park design, construction documents, and permit process almost complete) is being lumped with the tragedy of the World Oil site. Please visit our website, obcdc.org, to see what a group of local Obecians on an all volunteer board have accomplished. We will be breaking ground on building a beautiful and evironmentally friendly Entryway park within 1 year. It would be great if you could rally your readers around the great progress we are making and ultimatly great entryway we will provide for our community. Thank you. Chris – thanks for your input. Might I suggest a couple of things: first, make your comments on a more recent post – that way people will see it; and second, if you like, why not write an article for the blog – submit it via email to us – use your basic thoughts and expand them. Time to redevelop OB. Its a gold mine but the bums need to go. It could be awesome but its not due to the lack of care by the locals. It isn’t a question of “if” it will be redeveloped its a question of “when”. It doesnt have to be like La Jolla but it looks like garbage. Put some effort into it and people might accept the change and embrace a step up. Some people like the fact that it is so laid back but that attracts drones of homeless and druggies. OB needs to figure it out and get some people on the boards that know what they are doing so that it can be made into a somewhat sanitary and desireable place to go. I believe there is redevelopment in OB. The PL library, OB People’s Food Co-op and the 1000 building at PLHS have all been important additions to redevelopment of Voltaire. In addition, Stumps has redeveloped their property and the Dog Wash has cleaned up the canine population with a successful business on Voltaire. Five year old story and nothing has changed. WTF OB? Maybe The Boss will get his/her wish now that World Oil owns the old Dover Plumbing building. Or maybe they will bulldoze it and leave it a vacant trash heap for another decade… World Oil is funnny that way. My apologies to the CDC. The entryway plan is only 16 years old. Crazy to think that corner would be landscaped by now. Few hundred thousand more ought to cover some plants. All-volunteer is what Voltaire Park was, thats not the CDC. I wanted to run this story by Marc Snelling to remind OBceans of the history of these projects. Things don’t occur in a vacuum. For the record, Marc Snelling’s statements regarding funding of the OB entryway was inaccurate. Despite OB saying No to redevelopment funding, I used a variety of other sources (CDBG, gas tax, general fund, etc.) to fund the OBCDC to purchase the old Anthony’s Pizza and remove the billboard. The City Council went on to establish the North Bay Redevelopment Project Area which provided tax increment including nearly $5,000,000 in funding the Point Loma Hervey Library, $575,000 for the Peninsula YMCA and other worthwhile projects. If OB had said yes to redevelopment funding, the OB Library expansion and other public streetscape (sidewalks, new streets, lighting, etc) projects would have been done by now using tax increment funding from the Midway Sports Arena area. I was able to secure Hotel Motel TOT funding from Mission Bay to build the OB Skateboard Park and expand the final soccer field at Robb Field. Innacurate how? What I said is that a redevelopment district and blight definition did not work but the money came for the project anyway. You are providing the specifics of where that money came from in your post. With all due respect calling OB blighted even if it solely for the purpose of securing funding is ridiculous. Perhaps we just have different viewpoints? You are a Point Loma native and lifetime resident of San Diego no? I lived in San Diego/OB for a litle over a decade but have lived in several different cities and rural locations. If the only other place you’ve been besides OB is Point Loma or La Jolla I can sort of see the blight definition. But compared to anywhere else? Real blight is Detroit. I can’t think of a single neighborhood in San Diego that comes anywhere close to that. Personally I liked Anthony’s and went there frequently. To tear it down and then take so many years to complete the project is not impressive to me. Not everyone agrees that the Peninsula Y was a worthwile project either. But I don’t claim to speak for the majority. You can say these projects like the OB Library would have been done already with redevelpoment funds but could they not also have been done by reprioritizing money from the general fund and other sources? The OB Library only seems to have become a priority after an outcry from the public. If it had been left up to our City representatives would it still even be there? Did I miss something? Is Mr. Wear running for office again? 1. OB was only proposed for a survey to determine if OB or a selected portion could qualify for the definition of “blight” under California law to be included in the North Bay Project Area. The OB Planning voted not to be included in the redevelopment survey at the early stage. 2. Funds used for various phases of the OB entryway project did NOT come from redevelopment. The entryway funds came from gas tax, Community Development Bloc Grant, Mission Bay TOT and the general fund. Redevelopment funds were used for the Peninsula YMCA and the Point Loma Library because those projects were located within the North Bay Redevelopment Project Area, which no longer exists. 3. As a longtime Peninsula resident and Councilmember, I always looked for creative ways to get funding into my district and the communities that I represented. For example, the $4 Million in SDG&E undergrounding funding of West Point Loma Blvd., Voltaire St. and Sunset Cliffs Blvd. was transferred from downtown’s East Village. 4. I arrived in OB in 1964 and have lived in 92107, 92106 and a few years in 92109. 5. The OBCDC, OB Planning Board, OB Town Council, and OB Main Street all supported the vision of the OB Entryway. We were able to remove a mega billboard that was an ugly entrance into OB. 6. I agree that Detroit has serious issues. 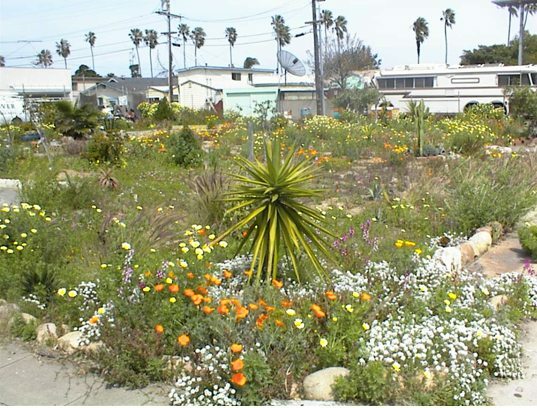 Here in San Diego we had the benefit of California Redevelopment Law as a “tool” to create wonderful neighborhoods. 40 years ago you wouldn’t be caught dead south of Broadway in downtown San Diego. I think East Village, PETCO Park and the 27 blocks are a good example of transforming a neighborhood. But, I do agree that there have been abuses of California Redevelopment Law, i.e. the City of Coronado. 7. Implementation of the OB Entryway project by the City of San Diego was clearly a problem. No question about it. But the community vision of the entryway as a good one. 8. The YMCA project is making a difference in our community. The joint use Gym with Correia Middle School in exchange for parking was good. Over $300,000 is raised each year by the volunteers at the YMCA to assure that every person has access, regardless of the ability to pay – whether it be for camp scholarships or memberships to single moms with a kid or two in tow. 9. If, in fact, Ocean Beach or a portion of OB (where the library is located) could have been included in the North Bay Redevelopment Project area, “tax increment” from the North Bay Project Area could have been used for the OB Library. Before I left office I was able to use $1.8 Million in Federal Community Development Block Grant funds to buy the parcel immediately west of the existing Library for the proposed future OB Library expansion. But redevelopment funds could have been used for construction of the library if OB was part of North Bay redevelopment. I have always been a strong proponent of libraries and was glad to build the Pacific Beach Taylor Library and the Point Loma Hervey Library also laying the foundation for downtown. I consider the OB Library to be worthy of expansion but keeping the historic building as part of it. Finally, I retired after two terms on the SD City Council and now serve as a community volunteer. All the best for a wonderful Thanksgiving Week and Holiday Season. I was on the OBPB and was an OBMA member back then so remember it well. Approving of the concept is not the same as approving of the execution, which you note is a “problem”. 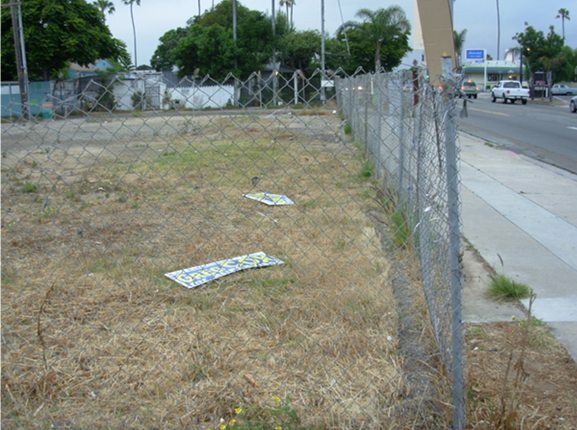 That billboard was no more of an eyesore than an uncompleted project or a vacant lot. Your points go beyond the scope of this article. My focus was lack of progress on the entryway and the destruction of Voltaire Park only to leave it as another vacant lot. The Y, the library, and larger redevelopment issues aren’t really what this article is about. And if we want to talk redevelopment from this era we should be talking about NTC/Liberty Station. Perhaps you should write an article of your own and submit it the Rag? We just have different viewpoints. Like the flight we shared to San Diego after W’s inauguration… don’t think we were in DC for the same reasons. I think the second to the last sentence in Mr. Wear’s comment is a bit unclear. He did not “retire” from the City Council or from working. He served two terms and was termed out. He has been working ever since as a paid land use and real estate lobbyist. See Wear Strategies http://wearstrategies.com/. While I was on the Peninsula Community Planning Board (PCPB), I witnessed Mr. Wear’s behind the scenes influence as he got a collection of people to run for the PCPB and eventually take it over, putting a halt to that body actually questioning development and challenging those interests. For about six years, the PCPB was basically non-functioning and that was what those interests wanted. Mr. Wear takes a lot of credit for a lot of things but not what happened with the PCPB, he stayed in the shadows. What surprises me is that he still wields any influence at all. For the record, I am, in fact, retired from the City of San Diego as a former Councilmember and Lifeguard Lieutenant. Date of Retirement Effective December 4, 2002. Since I have left the Council, I have worked as a land use and transportation consultant. The only actual “lobbying” I have ever done is in OPPOSITION to one development project. I believe we are currently fortunate to have a well balanced Peninsula Community Planning Board and have enjoyed working with them on many items including the recent amendment to the joint use agreement at Dana Middle School and the completion of the $1.5Million renovation of the David Wells Field for Point Loma High and assisting their Park and Recreation Committee in the visioning of a new pocket park at the end of Avenida de Portugal at Canon. As a former member of the Peninsula Community Planning Board (1981-87) and Chair of the Peninsula Plan Update Committee in 1986, I make it a point to vote in every Planning Board election. I continue to remain an active community volunteer with the YMCA, San Diego Junior Lifeguard Foundation, San Diego Lifeguard History Project, OBCDC Saratoga Park TOT Lot Committee, Point Loma High School Baseball Boosters, Point Loma Association Nimitz Parkway Task Force and as a co chair of the Point Loma Community Presbyterian Church Annual Day of Service. I guess I’ll start by repeating my earlier comment, I didn’t realize you were running for office again. I was merely clarifying the sentence in your previous post that gave the impression that you were retired from the City Council and were now just a community volunteer, which was not entirely accurate. As you have said here, you now work as a land use and transportation consultant. So, if you are not a lobbyist, what expertise are you providing regarding land use and transportation projects derived from your years as a lifeguard and two terms on City Council? Lobbying comes in many forms. Written like a true politician. The PCPB voiced its opposition to the amendment regarding Dana Middle School, that is really all it can do. The PCPB did not have anything to do with the David Wells ball field, it is not within its purview to be directly involved in a project like that. And, the PCPB started the idea of a pocket park on Canon Street years ago, former PCPB Chair Cynthia Conger was one of the first people to identify this as a possible park. How did you assist in “visioning” this one? Not sure what your point was in this statement. Good for you? Community service is a wonderful thing. Some people do it with completely altruistic motives. Some people do it to maintain necessary business contacts. It can be very hard sometimes to discern which is which. Maybe it would be a good idea to enact a law that forced every owner of a vacant lot where normally a house or building should stand to plant a park or something similar as an interim. 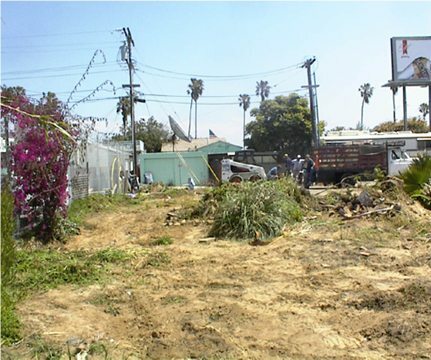 Failing to comply the authorities then could order, again as an interim until zone-appropriate development commenced, the fences to be brought down and some public interest group to plant it themselves, being reimbursed to the amount the empty lot yielded property taxes. Greetings. We are so blessed to live in the Point Loma and Ocean Beach community. I am particularly thankful this week for a healthy family, wonderful friends and a caring community. Once again to clarify, I am not running for any public office. I have always enjoyed serving the community in my past 50 years growing up and raising my family in Point Loma and Ocean Beach. Due to my service and experience as a Councilmember, I have been invited by many community organizations to help them with issues and interface with government. Although I have worked on technical issues of land use, historic designations and a few other projects here and there professionally as Wear Strategies, I actually spend the vast majority of my time on volunteer service. Specifically, I was asked to act as volunteer Project Manager for the OB Lifeguard Bronze and secured a Right of Entry Permit for the construction and raised the funds to complete the project. As a result, OBCDC recruited me to co chair the OB Tot Lot project right of entry permit process and led the first successful workshop earlier this year with many in Ocean Beach attending and participating. I was then recruited by the Point Loma Association to help in the visioning of Nimitz Blvd (Parkway) and organized the first workshop. As an alum of Point Loma High (Class of ’72) and a volunteer for the Point Loma Baseball Boosters, I came before the Peninsula Community Planning Board two years ago and PCBP voted unanimously to support the amendment of the joint use agreement between the City the School District to return the PLHS baseball field back to the school district. It took eight months of meetings before the OB Rec Council, Park and Rec Board and others. We will dedicate the new $1.5 Million David Wells field at 2:30 pm on December 4th. 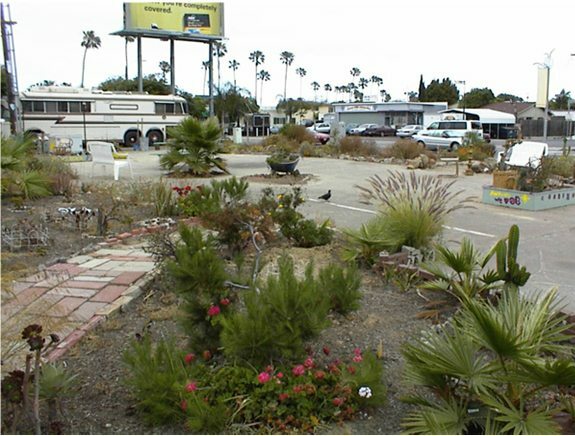 And most recently, I was asked by three members of the Peninsula Community Planning Board to help with the vision of the proposed park at Avenida del Portugal, as we (PCPB) included wording in the 1987 Community Plan for a potential pocket park at the location. I have attended two meetings thus far, provided photos of other Peninsula parks and walked the site. In many cases, all of these volunteer projects require interface with various government departments or knowledge of city laws and policies. Many times volunteers get frustrated in dealing with government agencies and they need help. And I will imagine I will get more calls in the future to help with volunteer community projects which I enjoy. If you would like help in discerning, I will be glad to buy you a cup of java any morning at New Break. Yes, community service is a wonderful thing! Blessings to you, Geoff and your family this holiday season. Well, it appears I have somehow managed to offend, a saint. I guess I missed one of the other reasons some people have for all their good works, a constant need for approval. But hey, how can anyone criticize someone who opens and closes with a blessing? Right?